River Ave. Blues » Yankees 7, Orioles 5: Luke Voit? Luke Voit! Yankees 7, Orioles 5: Luke Voit? Luke Voit! It took ten innings, but the Yankees were able to outlast the 1927 Yankees 2018 Orioles in Friday night’s series opener at Camden Yards. They “improved” to 7-6 against the O’s this season with a 7-5 win. The Yankees are now 80-47 on the season. It’s the first time they’ve won 80 of their first 127 games since 2002. Their eight extra-inning wins are their most since 2001. Two times the Yankees fell behind by two runs Friday night, and twice they rallied to tie the game. Luke Voit knotted things up 2-2 in the fourth inning with his first home run as a Yankee. Neil Walker stroked a single to center earlier in the inning, then Alex Cobb hung the hell out of a curveball to Voit, who deposited it into the left field seats. Luke Voit? Luke Voit! He hadn’t shown much of anything prior to Friday night. Good to see him contribute. The Yankees fell behind 4-2 in the seventh inning — David Robertson gave up a two-run opposite field home run to Jonathan Villar on a cutter that looked like it was off the plate — but they rallied to tie the game in the eighth, and they did it with soft singles. Giancarlo Stanton worked a leadoff walk, Miguel Andujar and Walker sent bloop singles to center, then Gleyber Torres inside-outed a two-strike fastball from Mychal Givens to right field to score two runs and tie the game. The Yankees had four hits in their previous 41 at-bats with the bases loaded prior to Gleyber’s two-run single. Oy vey. Anyway, the game went from 2-0 to 2-2 to 4-2 to 4-4. Good start for CC Sabathia in his first game back from the disabled list, though the first inning didn’t go too well. It was kind of a dumb inning. 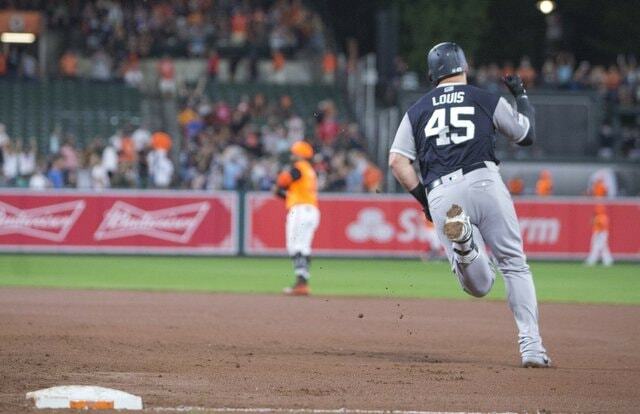 Cedric Mullins shot a ground ball single up the middle, Jonathan Villar reached on a bunt because no one was home at first base after Voit came way too far off the bag to attempt to field the grounder, then Chris Davis pulled a two-strike ground ball single through the right side to score two runs. Davis is terrible, but Sabathia left a slider up, and Davis got enough of it for a single. Just like that, the Yankees were down 2-0. Sabathia settled right down following that Davis single — he struck out the next two batters to strand runners on the corners — and retired 17 of the final 20 batters he faced, and only four of those 20 batters hit the ball out of the infield. Seven of the 20 struck out. Home plate umpire James Hoye had a wide strike zone and Sabathia took full advantage with inside cutters and backdoor sliders against all those right-handed batters in Baltimore’s lineup. There were some mistake two-strike pitches to Mullins and Davis in the first. Otherwise Sabathia looked sharp. The final line: 6 IP, 5 H, 2 R, 2 ER, 2 BB, 8 K on 80 pitches. 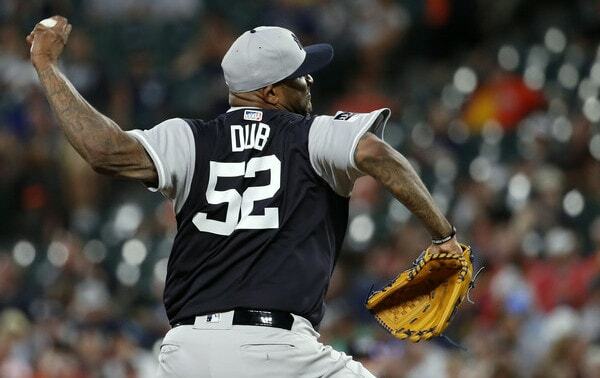 It seemed like there might’ve been enough gas left in the tank for another inning, but it was Sabathia’s first start off the disabled list, and the top of the order was coming up for the third time, so it was a good time to get him out. It is now late August and Sabathia has a 3.30 ERA (4.24 FIP) in 23 starts and 125.1 innings on the season. The big man’s still got it.
? Voit’s got a little Sammy Sosa hop in his step, eh? One homer to left, one homer to right. Just like that, he raised his overall season batting line from .207/.281/.310 (63 wRC+) to .265/.324/.529 (130 wRC+). Hooray for small sample sizes. After the game Aaron Boone said Voit could “absolutely” earn more playing time at first base. “Performance matters,” the manager said. With Greg Bird struggling, the door is open for Voit. Anyway, the two home runs against Carroll gave the Yankees a 7-4 lead in the tenth inning. Britton came in for the save and allowed his third home run since the trade. Chris Davis got him. Britton has allowed three fly balls as a Yankee and all three have gone over the fence. How dumb. Britton has allowed 35 balls in play as a Yankee: 31 grounders, one humpback line drive to the shortstop, and three fly ball homers. Whatever man. Britton ultimately closed it out and that’s all that matters. Dellin Betances tossed a scoreless eighth inning despite allowed back-to-back one-out singles. He struck out two to get out of it. Betances has struck out at least one batter in 32 straight appearances now, tying Jeff Montgomery’s American League record. Aroldis Chapman has the all-time record at 49. Dellin might run out of season before he can get there. Chad Green threw a 1-2-3 ninth with two strikeouts and looked like 2017 Chad Green. The Orioles were very obviously in “we’re not going to let Stanton beat us” mode. They walked him whenever possible. Three walks in five plate appearances for Stanton and 14 walks in his last 17 games. I suspect more walks are forthcoming, at least until some guys get healthy. Walker and Voit each had three hits and Andujar had two. Those three went 8-for-15 (.533). The rest of the Yankees went 2-for-24 (.083). And finally, the Players’ Weekend jerseys look so much better with the road gray pants rather than the home white pinstriped pants, don’t they? Here’s last year. Yeah, the gray pants look a million times better. The Orioles? I’m going to have to watch the rest of the series with sunglasses. Their Players’ Weekend jerseys are too orange. Another doubleheader. Fifth this season when you include the suspended game in Washington. The Yankees have split their previous four doubleheaders. Would be nice to sweep one of them at some point. Anyway, J.A. Happ and Jimmy Yacabonis are the scheduled starters for the first game Saturday. Sonny Gray and Andrew Cashner have the nightcap. The games will be played at 1pm ET and 7pm ET.